Social Survival is a practical manual outlining what it means to be a logical thinker and how logical thinkers can make sense of the social world. 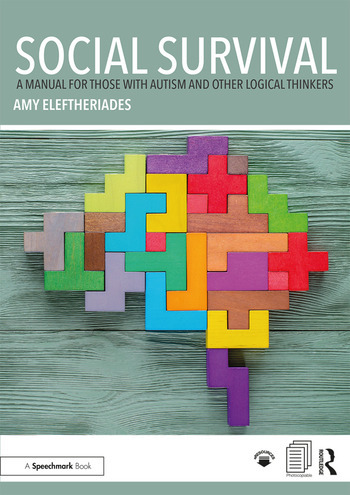 Relevant for young logical thinkers including those with high-functioning autism and Asperger’s syndrome, this book clearly outlines how social confusion might arise and how this can be overcome. Written in a clear and unpatronising style, the book considers a range of different social scenarios and breaks these down into manageable components with helpful activities to be completed by the young person. Chapters discuss the nature and benefits of logical thinking, nuances of language and communication in social situtations, and the intricacies of social etiquette and peer interaction. an action plan which can be personalised for different scenarios. Social Survival will be essential reading for health, social care and education professionals and parents working with those who have high functioning autism or Asperger’s syndrome or those who are logical thinkers who do not have a diagnosis. In addition, this book can be used independently by the young person themselves. Amy Eleftheriades has 20 years’ experience working with children and young people in a range of settings as a Residential Social Worker, teacher, SENCO and as an Advisor to schools. She now provides training to schools and families to support better communication for children with Autism Spectrum Disorders through her own organisation, Alpha Inclusion.